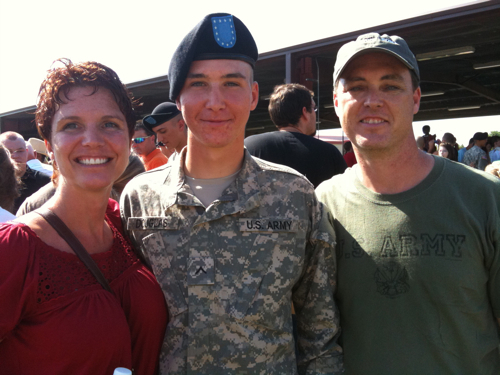 Our family spent most of last week at Ft. Sill, OK as our youngest son graduated from Army Basic Training. Tyler has played soccer since age 5 and lifted weights in high school but we didn't realize how physically fit he was. Out of his entire Battery (roughly 200 soldiers) he scored the highest on his PT test; 306 out of 300 possible points. He was promoted to E-2 and walked across the graduation stage second after the distinguished honor grad for the cycle. It was encouraging to see graduates from all 50 states plus Guam and Puerto Rico. Tyler's now at Ft. Bragg for AIT (37F - Psychological Operations Specialist) and then will probably stay there for SERE school, then head to Ft. Benning for Jump School and finally to Monterrey CA for language school for a year. He hopes to get Arabic. It was nice being back on an Army post and I felt quite at home. I love the Army as race seems to matter much less than in the general population. You see whites, blacks, hispanics and asians working together and taking order from one another. It doesn't matter what color they are just that they are all soldiers.